Read the book that Ali Standish (author of The Ethan I Was Before) calls "a heartwarming story" and Melissa Roske (author of Kat Greene Comes Clean) calls "a joyful, heartfelt debut!" Thirteen-year-old Jamie Bunn made a mistake at the end of the school year. A big one. And every kid in her middle school knows all about it. Now she has to spend her summer vacation volunteering at the local library—as punishment. What a waste of a summer! 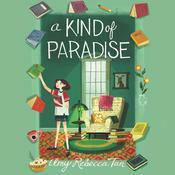 A Kind of Paradise is an unforgettable story about the power of community, the power of the library, and the power of forgiveness.